To realize our goal in giving you more unique and useful design resources, we give you another nice freebie today. The art of sketching or making simple doodles is not a skill that every designer has. Some of us can’t even draw straight lines or even simple drawings either on paper or computer. Today’s freebie will focus on supplying this essential need. 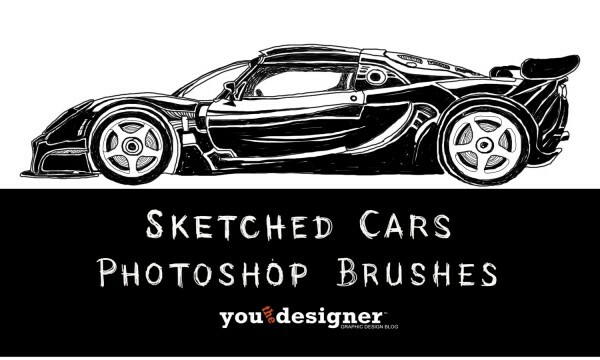 I give you a rare set of brushes consisting of hand drawn car models for your inspiration and help you skip all the difficulties in the sketching process of your next design. This set of brushes is a nice companion for making customized designs for your car brochures, posters, website headers and more! Download this set of brushes. Click the button below and enjoy the awesomeness! [/sociallocker]Share us your thoughts or might as well suggest what freebie would you like to get from us in our next post by commenting below. Stay awesome everyone!